How many times have you heard this bit of advice? Find your niche and your ideal customers will find you. On some level, it’s solid advice. When you find your segment of a market, your brand message has more resonance, your marketing is more targeted, and your sales funnels convert better. To top it off, your competitors won’t even begin to match the connection that you build with your audience. Niche marketing is a very micro approach that won’t be successful without first getting insight into your market on a macro scale. You need to be flexible and allow your business room to evolve or you risk niching yourself into a box. Leveraging a strategy like content marketing makes niche marketing that much more powerful. Solé Bicycles is a perfect example of that. Coming from a very grassroots inception, the direct to consumer bicycle company has achieved tremendous growth. Ben Petraglia, one of the founders and head of marketing, shared how they used content to skyrocket their organic reach, and by extension, their revenue. In this case study, I’ll walk you through the techniques that have allowed them to achieve 100% growth, year over year. When businesses grow exponentially and continue to experience massive growth, you can bet your money that it isn’t a matter of luck. More than likely, they’re concentrating their efforts on a very specific and targeted approach. 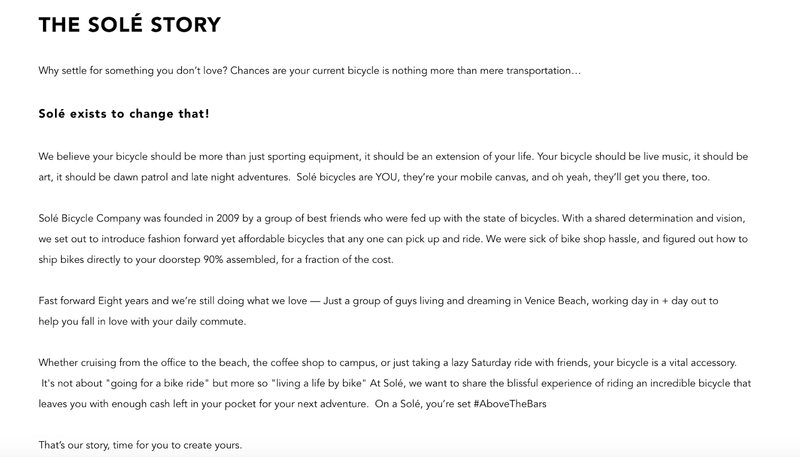 Solé bicycles, founded in 2009, have used niche content marketing to scale their business by leaps, without spending a fortune. Capitalize on a golden opportunity in the market trend and gap. In addition to being very price prohibitive, brick and mortar bike shops were a hassle from a customer’s point of view. Cut out the middleman and provide a better and simpler product direct to their consumers. Evolve, compete, and win even when other businesses began to attack their space with cheaper, lower quality products. The best part is, the techniques that they used are relatively simple. What made the difference is their execution. 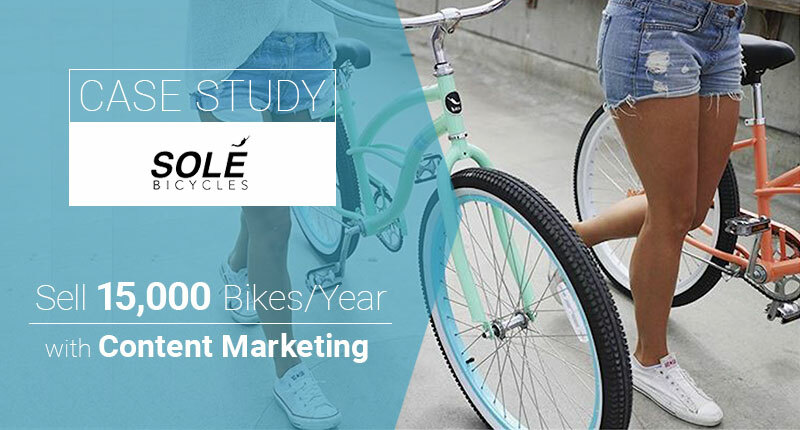 The question now is – how can you reverse engineer Solé Bicycle’s niche content marketing success? Market and product validation is everything. Your content marketing won’t be good without it. Your product won’t sell without it. Most people’s idea of validation consists of doing a simple google search for what their market size is and playing around with some numbers in their heads. First, do the math to make sure the numbers make sense. Brad explains how they spent a considerable amount of time defining their segment of the bicycle market. They used Google Trends to get a bird’s-eye view of their overall industry. This is a basic step to determine if there’s a space for you in the market and what direction it’s going in at the moment. The problem is, this is not a thorough or numbers-driven strategy so it won’t give you all the insights needed. That’s where the Google Keyword Planner the IBS Annual Reports come in. By analyzing various keywords relevant to your business idea, you can determine the market size as well as what percentage of that you can tap into. 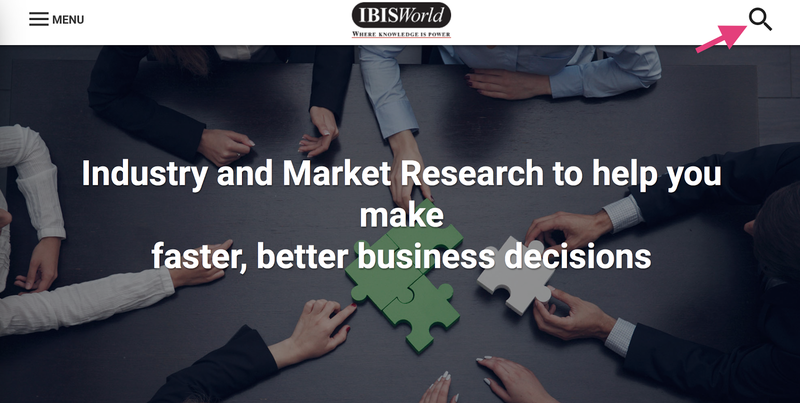 Similarly, IBS has an entire suit of market research reports for thousands of products and their corresponding industries. These give you a panoramic view of your industry, from the competitive landscape to predicted market conditions. This is what Solé used to dissect their industry and pinpoint where their opportunities were. Select the features needed to create a Minimal Viable Product. Solé used this to come up with bikes that were of high quality, 90% assembled, and easier for their customers to use than many of the options available. Identify what problems that the product solves and how the solution differs from everyone else out there. Get to know who your ideal customer is, their interests, their behaviors, and their exact pain points. Get a thorough understanding of supply and sourcing processes. Solé explains how their sourcing agent became a major key to scaling their business smoothly and spending their money smarter. Now that you know what information to extract from your research, it’s time to do the work. While I recommend that you invest in the IBS Reports, the first three steps in this process are foundational. You don’t have to spend a dime. Instead, you will be using free channels to first get insight into your market. After that initial overview, you can then purchase the reports and rest assured that your investment is going towards a viable business idea. Sound like something you’d like to know more about? Go to Google Trends and type in your business or product idea. When I type in the keyword, “bicycles”, I get a graph showing interest for the search term over a 5-year period. 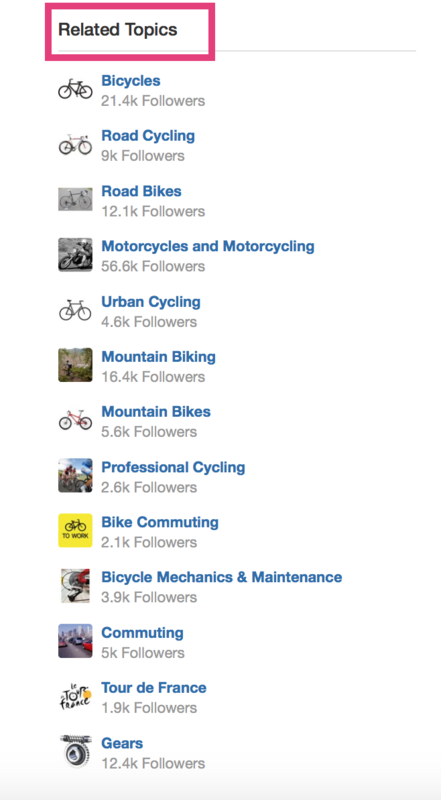 As you can see, search volume for “bicycles” is pretty much cyclical – it slightly fluctuates up and down, year round. You can toggle your results based on different countries, time periods, categories, and type of search. It tells a completely different story! As I went further back with my search, the term “bicycles” trended down steadily from 2004. Of course, the more recent trends are more relevant to the state of the market. So what are some of the tell tale signs that you need to look for? (i) If there’s a surge during a particular period, it’s an indicator that this is the prime time to launch your product as well as push your content marketing efforts. (ii) If there’s a steady dip, that’s a red flag – you don’t want to jump on a sinking ship. (iii) If it’s cyclical, it’s a matter of riding the market trends as they fluctuate throughout the year. After getting results for your general business idea, you want to explore related queries and topics. This will give you minor insight into varying subsets of your market or if there’s a major competitor dominating the searches. Plug in different keywords, play with the options available for your search parameters, and compare all your graphs. You’ll have an overall indication of the demand for your product. Pricing is a tricky subject. Some merchants simply mark up their product by a percentage that will give them a healthy profit margin. Others use number psychology. It’s why many people end their prices with odd numbers like 7 and 9. They’ve been proven to convert better. The most effective strategy is to use your competitors’ pricing as a baseline. (i) Browse through different marketplaces and your competitors’ websites to determine what they’re charging. First, create a spreadsheet to track this data. If you plan on selling more than one product, simply add new sheets to include the different SKUS. (ii) Factor in your costs. Regardless of what pricing strategies you use, this is a must to ensure that you make a profit. What will it cost you to take your product from manufacturing and into the hands of your ideal customer? Bare in mind that you won’t get a precise figure as there are many indirect and unforeseen costs of operating a business. What are the factors that you can use in your preliminary pricing? Cost of raw materials – These are the materials that can be tied directly to the manufacturing of your product. For example, tires and pedals are a few of the raw materials needed to manufacture a bicycle. Cost of direct labor – The amount that you expect to pay for labor during the manufacturing process. Cost of overhead – These are the indirect costs associated with manufacturing. The best resource to get these costs is the IBS reports. (iii) Taking into account your time and money investment, how much revenue justifies starting your business? At this stage, it’s as simple as deciding what percentage of profit you’d like to make. 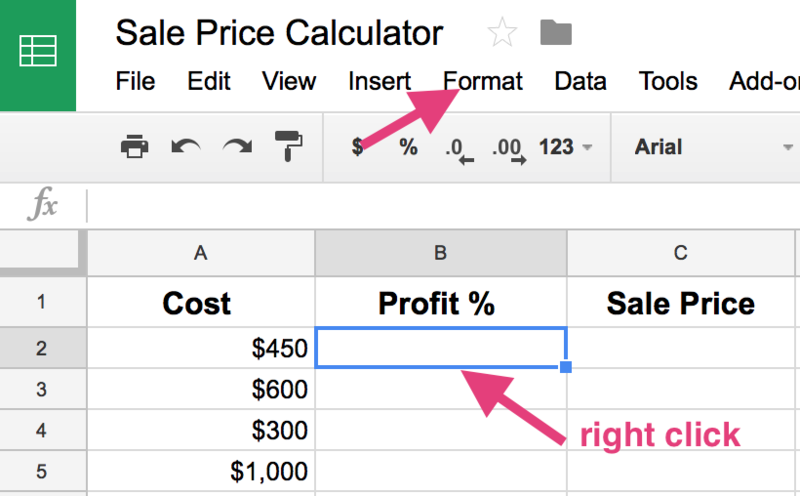 You don’t have to manually calculate the selling price of your product once you’ve determined profit % and cost. Instead, it can automatically be calculated using an Excel spreadsheet. Go ahead and create your spreadsheet. 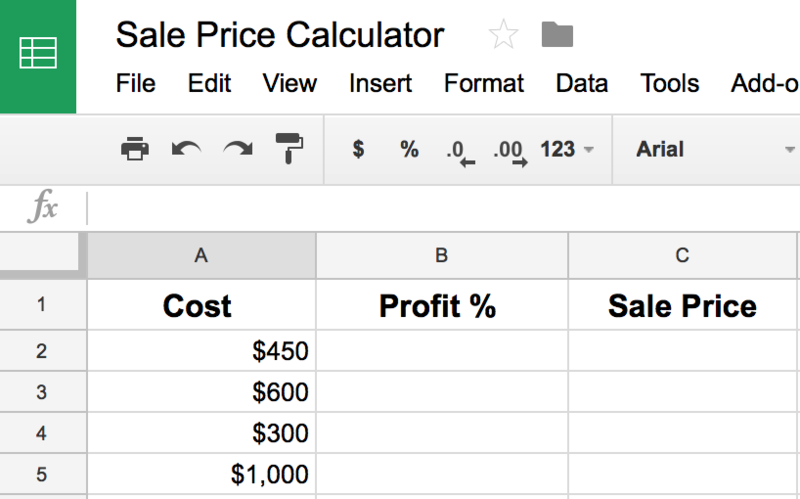 You should have 3 columns with the headings: “Cost”, “Profit %”, and “Sale Price”, in that particular order. Next, type in your total cost in the “Cost” column with a dollar sign. If you have more than one product SKU, simply type in all the individual costs. 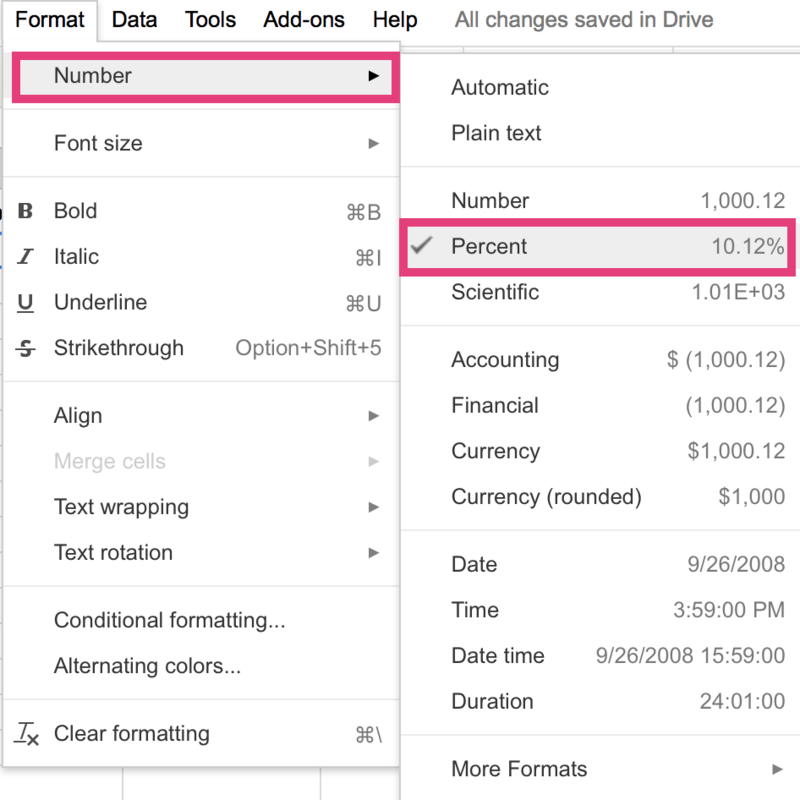 You want to format your cell as a percentage and not a whole number. Type in your desired profit percentages under the “Profit” column. 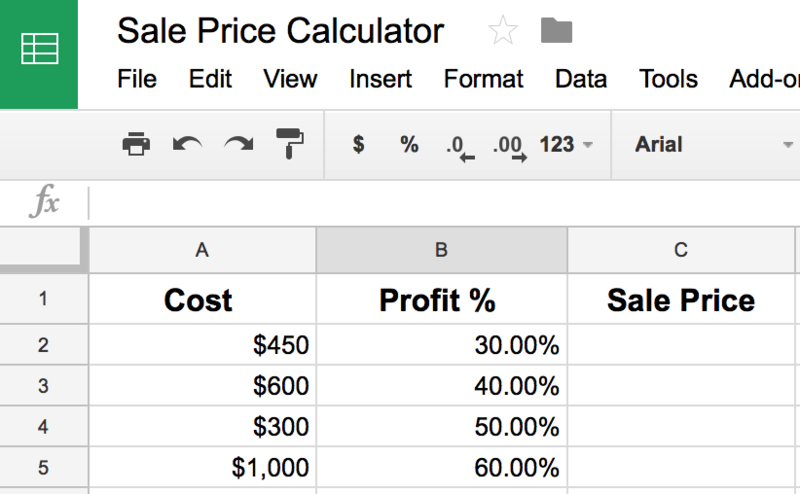 Here’s the general formula that you’ll be using to calculate the Sale Price based on Cost and Profit %. First, double click on the cell below “Sale Price” and type in the formula “=A2/(1-B2)”. The sale price will automatically be calculated. (iii) Apart from pricing your product based on cost, you should also consider the demographics and psychographics of your customers. Their spending habits, values, attitude towards your industry, as well as their perceptions, are all important factors for your pricing. To find industry-specific blogs, you can simply do a Google Search for your keywords and read the content that’s relevant to your product or industry. In the next step, you’ll learn how to generate more keyword ideas that you can also use for this process. 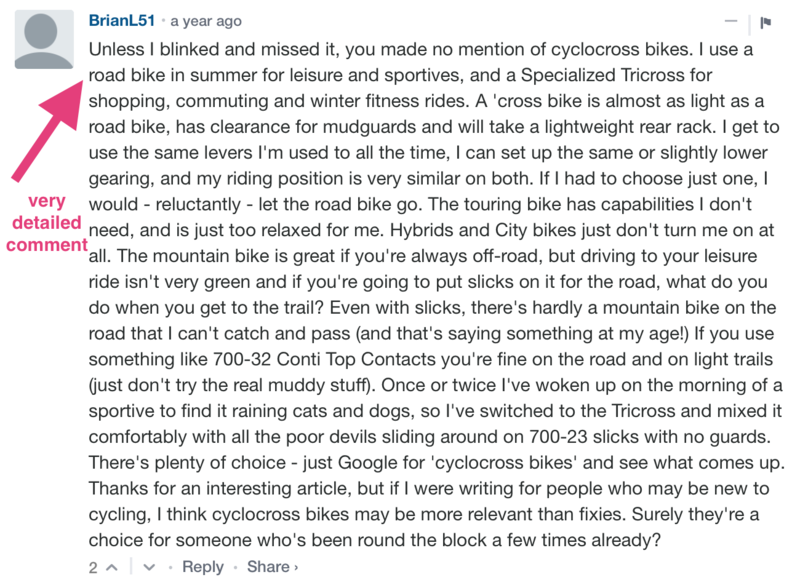 The comment section for these blogs are golden for getting insight into what your potential customers are thinking. You can also use a tool like Alltop to find blogs in your industry. 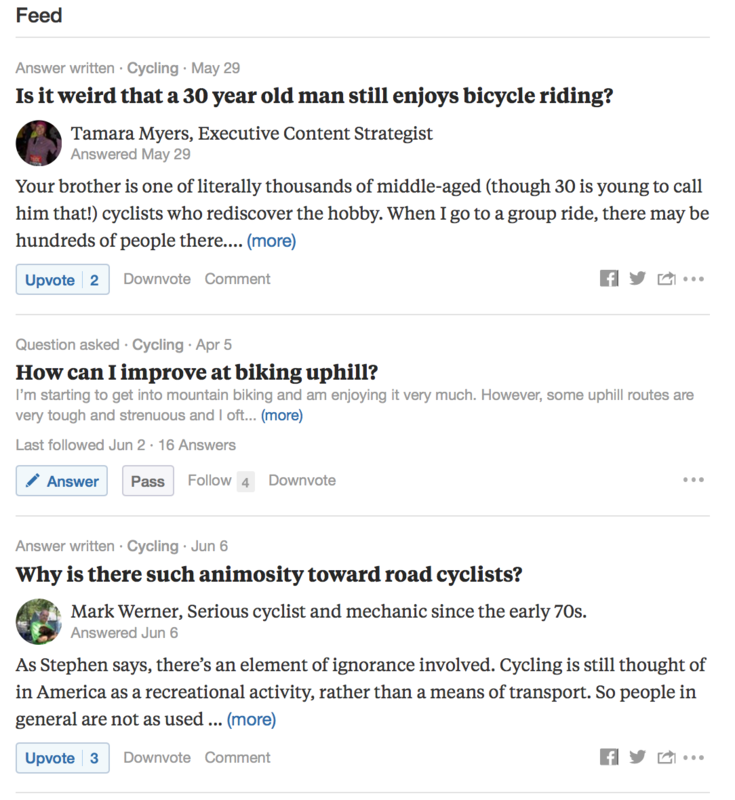 Where forums are concerned, Quora is one of the superior choices. Simply type in your keywords and browse through the results. You’ll see all the questions that potential customers are asking. You can also explore related topics on the right side of the page. 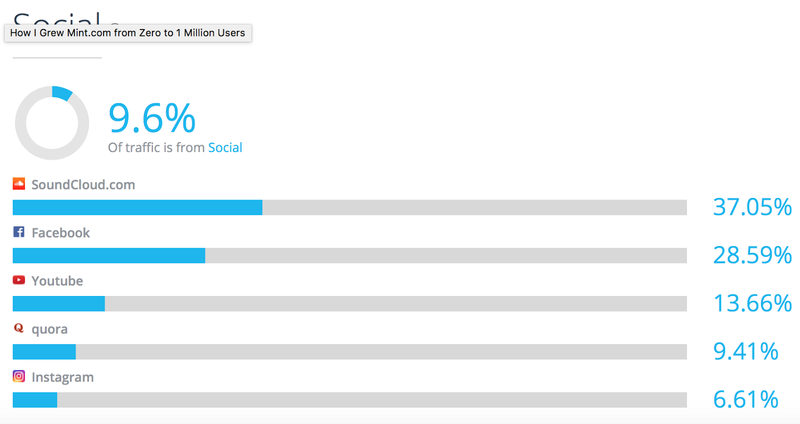 A great tool to spy on your competitors’ audience is Quantcast. You’ll get a range of data. What you want to pay attention to at this stage is the demographics, interests, and occupations of their website visitors. As you can see, you can get very detailed information on a competitor’s audience. Another sure way to get into the heads of your prospects is simply to speak to them. You can either conduct surveys or engage via forums and other relevant platforms. (iv) The final consideration for pricing, is to not get too attached to a particular number. There may be a time where you have to raise or lower your prices depending on where the market is headed. The key is to stay informed and be flexible. A good way to stay on top of trends in your market is to set up Google Alerts for keywords related to your industry. You can even monitor the conversations that are happening around your competitors by setting alerts for them as well. Alternatively, you can use a premium tool like Mention. You know where your market is headed. You have a price for your product. At this point, your goal is to determine the overall market size for your product and what percentage of that you can secure. 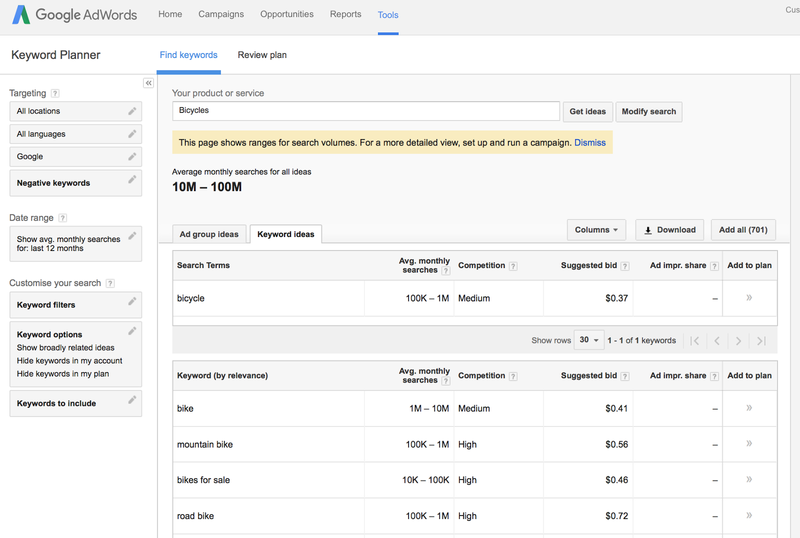 (i) Access the Keyword Planner via your Google Adwords account. If you don’t already have one, you can set it up in a few minutes. Once you’ve done that, it’s time to gather your keywords. Click on the tab that says, “Find new keywords and get search volume data”. Sift through the results and select the keywords that are relevant to your product or business idea. So how do you calculate market size from this data? You need the search volume for your keywords. 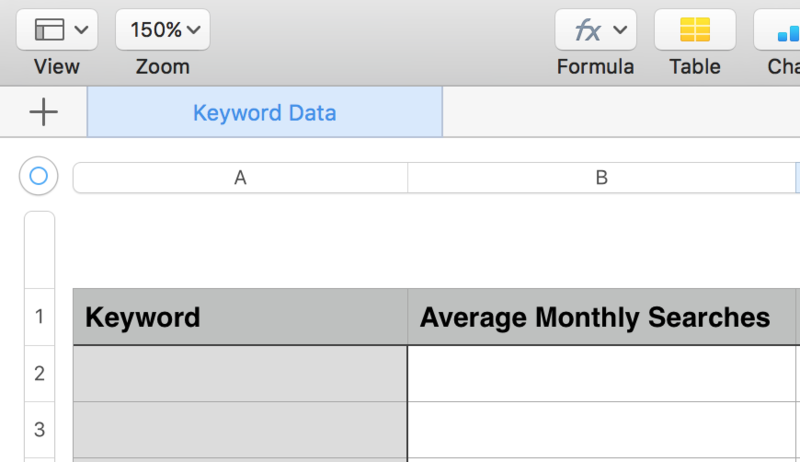 You can either create a spreadsheet to collect this data or download it directly from the Keyword Planner. Since you likely won’t use every single keyword that the tool spits up, I recommend going the spreadsheet route and extracting the relevant ones. 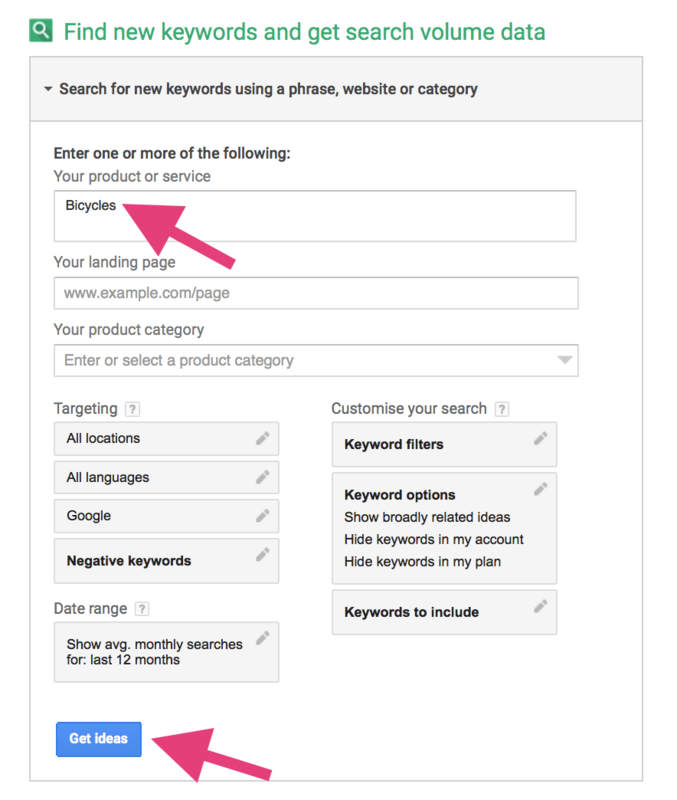 Once you’ve gathered all your keywords, take down the “Average monthly searches”. Then, add all these numbers up to get the overall search volume for your product. This final figure is your market size. It’s worth noting that calculating market size from keyword data isn’t an exact science. The more detailed your keyword research is, the more accurate your data and insights will be. Let’s talk about market share. Naturally, you won’t be targeting 100% of product market. Factor 1 – How much do you have to spend? If you’re going to be using PPC (pay per click), this is essential. Factor 2 – How will you drive traffic to your website? You can use organic methods like SEO and content marketing if you’re on a low budget. Factor 3 – What resources do you have to dedicate to these strategies? Getting eyes on your website organically requires a significant time and skill investment. In this post, we are focusing on content marketing. The most accurate gauge for determining market share is the CTR (click through rate) or organic search queries. 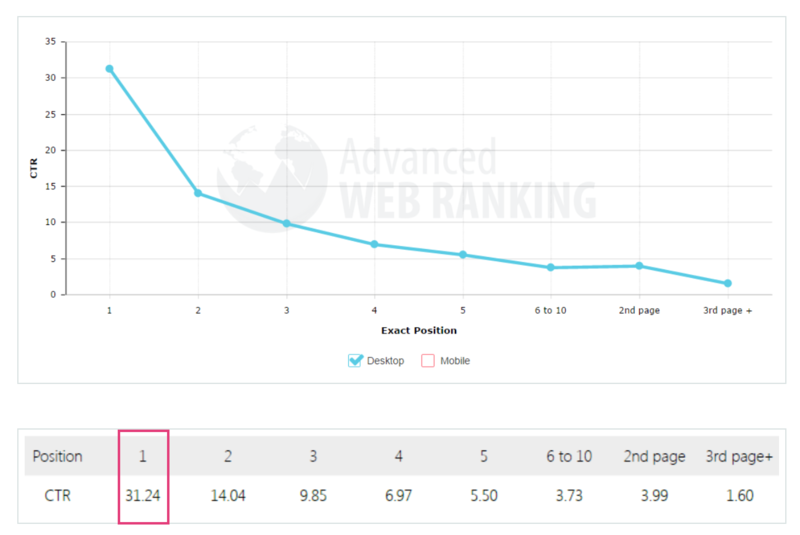 Looking at the chart above, if your content got ranked in the first position, you’d have a CTR of 31.24. That figure gives you a good indication of what market share you can expect to capture from your organic content marketing efforts. Now that you have a solid foundation, it’s time to dig deeper. Go to IBS website and plug your product or business idea into the search bar. After you type in your product, you can select which filter you’d like to search through. The caveat is, this is a premium research database. Without purchasing the reports, you can only get a sample or an overview. Should you make the investment? Absolutely. Reason 1: It will help you to manage and minimise the risk of starting a business. This initial market research also allows you to develop the most fail-proof playbook that you can have at this preliminary stage. This way, you can confidently follow through with your business idea because you’ll have the foresight to know the outcome. That’s not to say that there won’t be setbacks, but you get to assess the opportunities and risks, so you can determine the most efficient way to achieve that end result. It’s because of Solé’s extensive research that they were able to identify a gap in the market for a direct-to-consumer bicycle company. Reason 2: It gives you more leverage with potential partners and investors. Depending on your manufacturing and operational costs, you may decide that you need significant outside investment to get your business off the ground. Or perhaps, you want to partner with someone who brings a unique set of skills to the table. Either way, you need enough market research to convince potential investors and partners to bet on your business idea. Can you get the same depth of research without the reports? Possibly, but it may take you a very long time. With your market research out of the way, the next thing you need to do is gather real data to validate your the product. Testing your product is not to ask your friends if they like the idea. It’s not even to ask your ideal potential customers what they think. The best validation is a sale. So, get your idea out there as fast as you can. The best bet is to target people in your personal network who may have a need for your product. If you sell out your first run, you know that you’re investing in something that people are willing to pay for. For Solé, their validation came soon after coming up with their idea as they sold out their first 100 bicycles to friends and family. After that initial bike run, they took their store online and that was the beginning of their success. If you’re unsuccessful in leveraging your personal network, that doesn’t necessarily mean that your product is a total flop. The next step after validating your idea is to use quant-based marketing. This is about deciding what percentage of the market cap you need to target to meet your revenue goals. The work you do at this stage will help you plan out an effective customer acquisition plan. It will also give you the data to select your target PR channels and map out how best to use them to increase your PR presence. You don’t want to be marketing blindly. Instead, you want to hold yourself and your strategies accountable to a specific, number-driven outcome. So, it’s time to set some goals. Decide what your revenue goals are, at least for the first quarter, and work towards that. You would have better insight into how many people you need to reach so you can tailor your content marketing accordingly. I’ll walk you through the same strategy that Noah Kagan used to grow software company, Mint.com, to 1 million users. Granted, the steps will be tailored for e-commerce businesses. The premise of this strategy is that you’ll be working backwards from a specific goal. So, the first thing you need to work out is the numbers. Let’s say you want to achieve $20 000 in monthly revenue from a $250 product. You would need 80 customers every single month to meet your goal. Give yourself a deadline and commit to it. This way, you’re not chasing the same goal indefinitely. Now that you have a specific and measurable goal, the task now is to map out a plan to get there. We’ve already established that the strategy in focus here is niche content marketing. Knowing that, it’s time to flesh out the scope and details of your marketing plan. How many conversions will you get? To gain these insights, plug your target website or app into a tool like SimilarWeb. You will get data that includes traffic overview and other metrics. You can see exactly where this traffic is coming from. You can also get a breakdown for individual traffic sources. As you can see, this data is golden. I recommend using a master spreadsheet to track all of these numbers so you prioritise your targets for maximum impact. 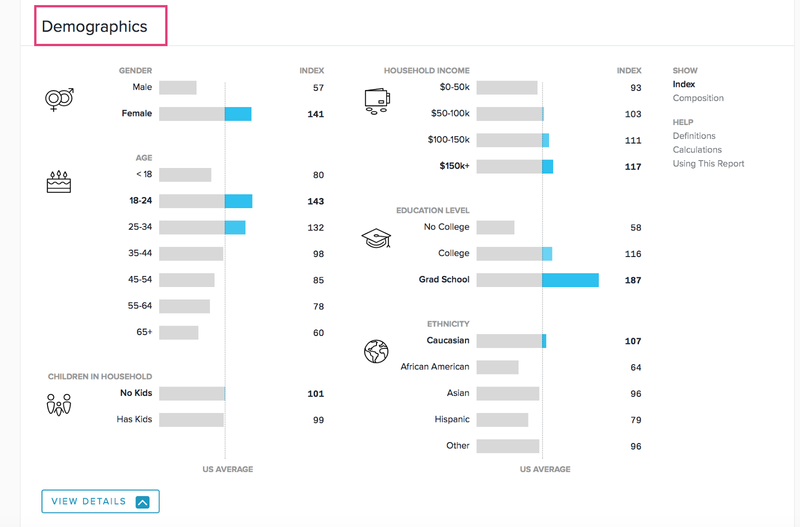 Based on these metrics, you can decide which channels to target and how many conversions you can realistically achieve. Of course, this isn’t an exact science. It’s a guestimate that allows you to predetermine the most effective steps to get to your desired goal. If you have a sizeable goal with lots of targets, it’s going to be difficult to achieve this in one fell swoop. You need to break your plan down into incremental steps. First off, it makes your goal more actionable and achievable. Also, when you have smaller targets, it means that you keep stacking on wins. The result? You’re more motivated to keep executing and working towards your goals. So, go ahead and divide your goal into smaller sprints. It’s time to put this into action! It’s easy to be ahead when you first move in on a relatively untouched market. But that dominant position that you get by virtue of first movers advantage doesn’t last for long. There’s nothing preventing others from infiltrating your market, duplicating your success, and competing with you on price and market share. The effects can be devastating for the business that doesn’t adjust quickly. For one, you may be forced to bring the price of your product down in order to remain competitive. This sort of price war can drive your business to the ground. When competitors begin to capture a larger part of the market share, they make it difficult and even more costly for you to pay to play. 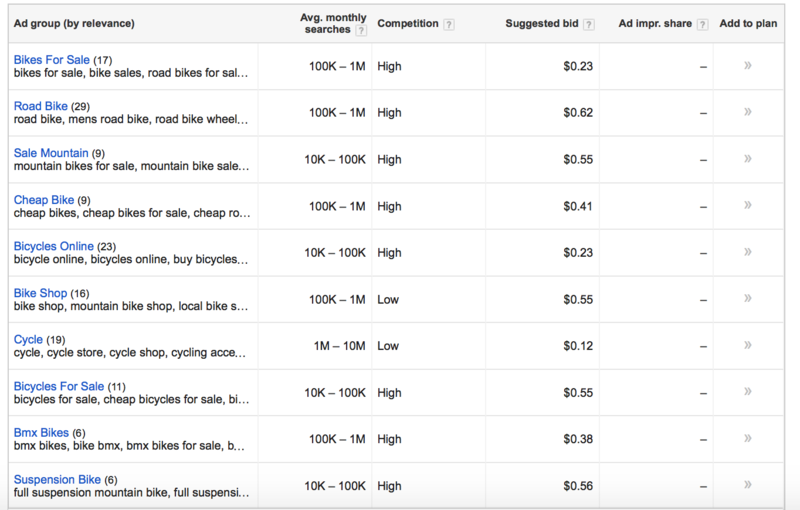 The Ad bid for Facebook and Google ads go up and so does your Customer Acquisition Cost. Your business quickly becomes unsustainable. Solé encountered this very challenge. In the beginning, they saw that leisure cycling was on the rise, cities were becoming more bike friendly, and people needed an easy solution. As such, they offered a quality bike that was easy to use and relatively inexpensive to purchase. When competitors entered the space and started competing on price, Solé got out of the rat race. How did they maintain the price of their products? They created something that couldn’t be duplicated. Instead of selling them solely on a bicycle, they sold their customers on an aspirational lifestyle which was tied to the product. So, how you can do the same? Presenting your product as the highest quality solution is not enough. Competing on cost is not enough. Any business can come into the market with that very same angle. The way to differentiate your business is to come up with a marketing focus that cannot be reverse engineered. For Solé, it was a matter of creating a gripping narrative – one that was shaped both by the individual stories of the founding team as well as that of their ideal customers. They saw that their target demographic enjoyed the same lifestyles that they were already immersed in. How do you approach your marketing from a lifestyle-specific viewpoint? In other words, their product was more than just transportation. It was both a gateway and an accessory to the lifestyle that they promoted. It was art, fashion, music, and an extension of their customer’s daily lives. It was a magnetic story that crowds of people gravitated towards. After you’ve crafted your unique brand narrative, it’s time to create content that is aligned with that vision. Let’s look at how Solé approached this. For one, they collaborated with different DJs to create music that would interest their customers. They curated this content and turned it into a monthly series where readers could submit their emails to download their favorite tunes. The result? The customer experience is improved and they now had access to each DJs audience. What’s also worth noting, is the type of content that they used. When people think of content marketing, they automatically gravitate towards blogging. Content marketing is so much more than words on a webpage. The way to tap into that is to engage with your audience to find out what will resonate best. (i) The simplest and most overlooked way to know what content your audience wants to consume is to ask them. You can do this by pitching content ideas to them via your email list or simply creating a survey. You can create surveys using free tools like SurveyMonkey or Google Forms. 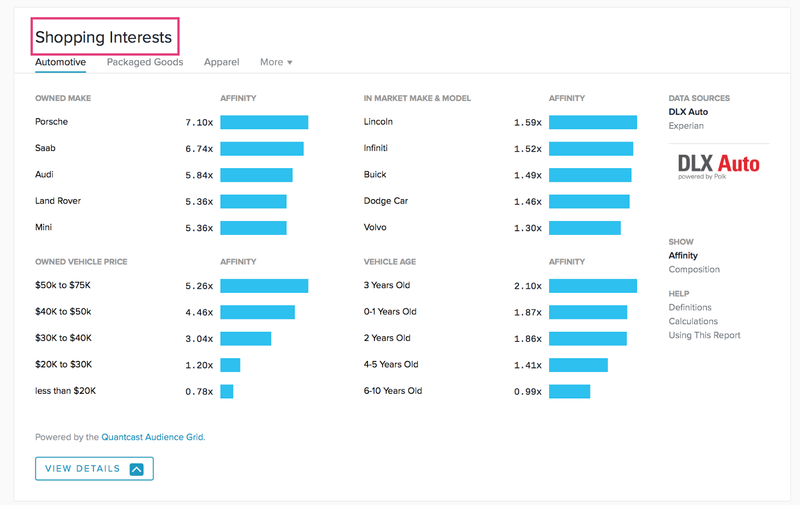 Apart from surveys, you can use a keyword tool like UberSuggest to find out what your target audience is searching for. First, type in your keyword and click “suggest”. 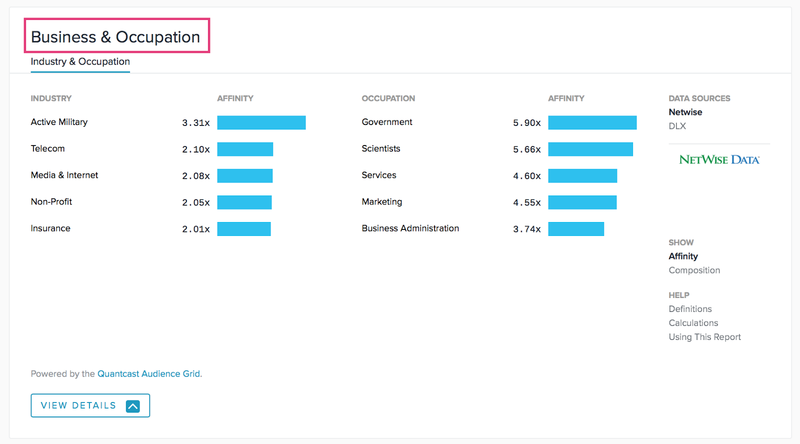 The tool will spit out the search phrases that your audience is using. 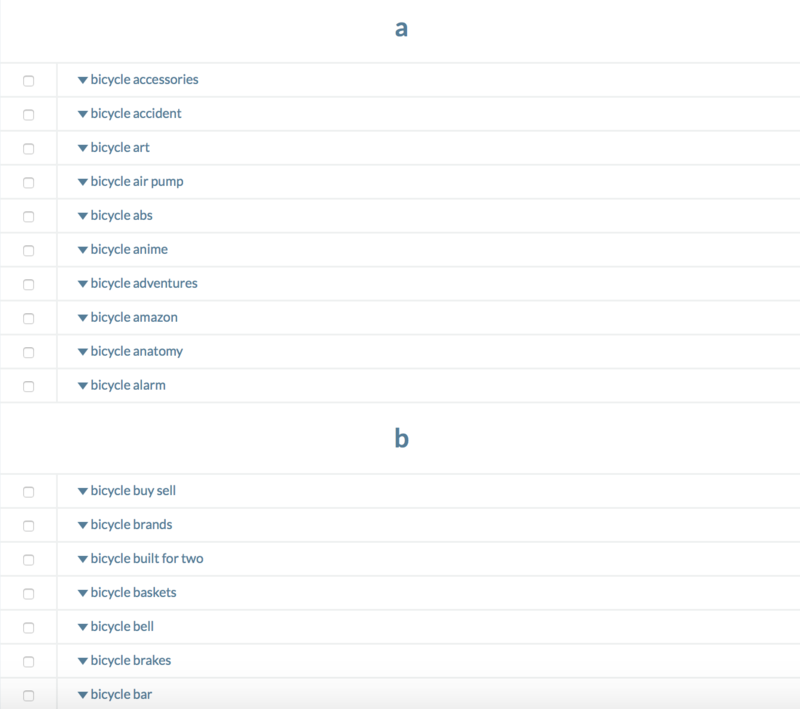 Here are my results when I type in “bicycle.” It’s alphabetised so you can imagine there are hundreds of phrases that you can use to draw inspiration from. To top it off, you can click on the individual results, expand them, and find even more search terms. (ii) Now that you’ve taken the guesswork out of the way, it’s time to refine your ideas and come up with concrete topics. The best filter is to decide exactly what you want your content to achieve. That’s where mapping your content to a marketing strategy comes in. Do you want to build your brand presence? Generate more leads? Drive more traffic to your website? Whatever goal you decide on, it’s going to determine which content ideas that you go with. These are the channels that you need to target. Consider partnering with anyone who is connected to the lifestyle that you’re trying to push. Remember, when pitching to strategic partners, lead with collaboration over promotion. Solé had a very specific method of approaching blogs and other influencers. First, they found out what was trending with their target audiences by reaching out to the owners of these blogs. Yes, their product was featured but there was a mutual exchange of value. A massive part of Solé Bicycle’s success was how brilliantly they worked their PR function. The had a compelling brand narrative. They niched themselves in both an industry and lifestyle-specific way. And they had a great product to back it up. 1. Communicate your message at every customer touch point. When you run an ecommerce business, your customers will come into contact with your business both online and offline. Your task now, is to ensure that at each touch point, you communicate your message effectively. 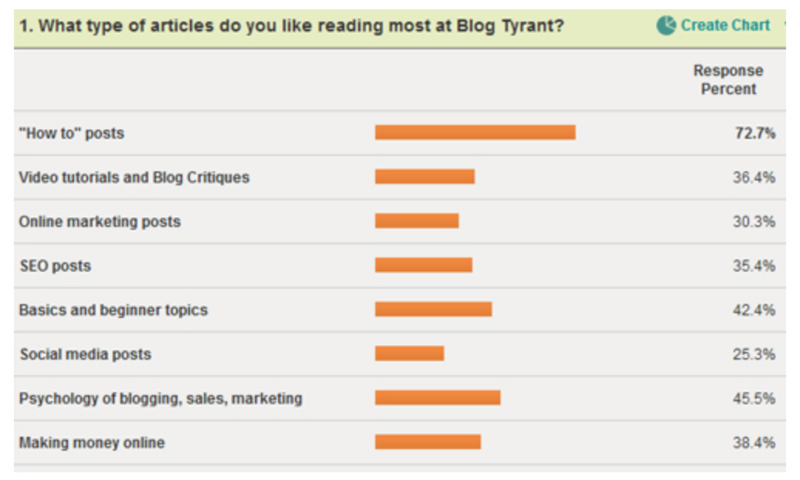 Does your target customer read specific blogs? Pitch content that sells your vision to these blogs. We’ve seen how Solé did this. Does your target customer live and socialise in a specific area? Make sure your product shows up there. Solé got models to ride their bikes around New York City during fashion week. They also did photo shoots with models in varying travel destinations around the world. Do you see how this type of visual storytelling fit perfectly with their fashion-forward narrative? Growing a thriving business from the ground up can take a long time. The good news is, nothing builds momentum around a product like a free promotion. Some examples include discount codes, giveaways, contests, and challenges. When executed well, they have the potential to build massive traction for your business that wouldn’t otherwise be possible with an organic strategy. Pick a specific marketing goal for your contest. For example, your goal could be to build your email list or grow your instagram following. This way, you can set your method of entry accordingly. Partner with influencers so they can advertise your promotion to their audience. The result is an increased number of entries and perhaps even a viral contest. Ensure that your prize is a slam dunk with your target audience. In other words, you want to pick something that people simply can’t pass on. It’s way less complicated than it sounds. It’s also necessary to ensure that your content gets in front of those who are looking for it. For one, in the digital space, this is how majority of people will come into contact with your business. They will type in a search query and look for the most useful and relevant piece of content. Sadly, most people will not look past the first page of search results. As such, it’s your job to ensure that your content gets ranked well so users have the best chance of discovering your business. 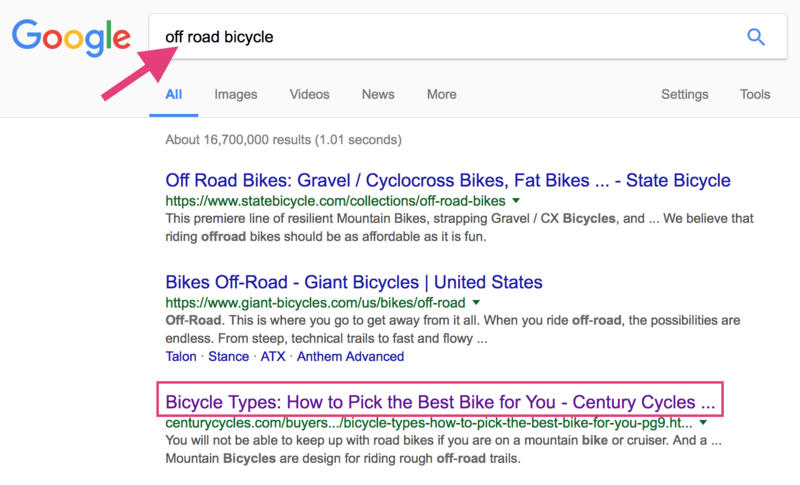 According to Ben, SEO was one of the easiest methods that Solé Bicycles used to drive traffic to their website back in 2009. The problem is, the SEO landscape has changed drastically from what it was back then. It’s now infinitely more difficult to rank both for organic and paid keywords. Does that mean SEO is no longer effective? Of course not. It simply means your strategies have to evolve as the search engine algorithms change. Keyword Research – Determine what search queries or keyword phrases that your customers would be searching for at each point in their buying cycle. The next step would be to create content that is aligned with these phrases. Link Building – The more backlinks that your site has pointing to it, the more authority that it commands with search engines. This means that your content will be ranked more favorably over others. You want to get backlinks from high-quality sites that are relevant to your product. On Page SEO – This includes elements like meta tags, title tags, URL structure, as well as the content on individual pages. The goal is to optimise these for your target keywords so your pages rank higher. Site Architecture – This is basically the way that your website pages are organised. This is essential for ecommerce sites as user experience has a lot to do with how well your product converts. If you want to keep optimising your marketing strategy, gathering data and insights is critical. But how do you measure the success or ROI of content? After all, the effects of content marketing are often indirect. There are a few key metrics that can be mapped on to the entire content marketing experience. Your click through rates, the number of comments, social shares, and email list growth are all figures that you can track from your analytics. A good rule of thumb that Solé used is to include CTA’s (call-to-actions) at the end of every content piece. This will give you a solid gauge of how people are engaging with your content. Of course, your CTA’s should be specific to whatever marketing goal that you have at the time. Looking to grow your email list? Create a content upgrade and nudge readers to enter their email addresses to receive it. Want to increase engagement? Ask readers a relevant question or ask them to share your content. 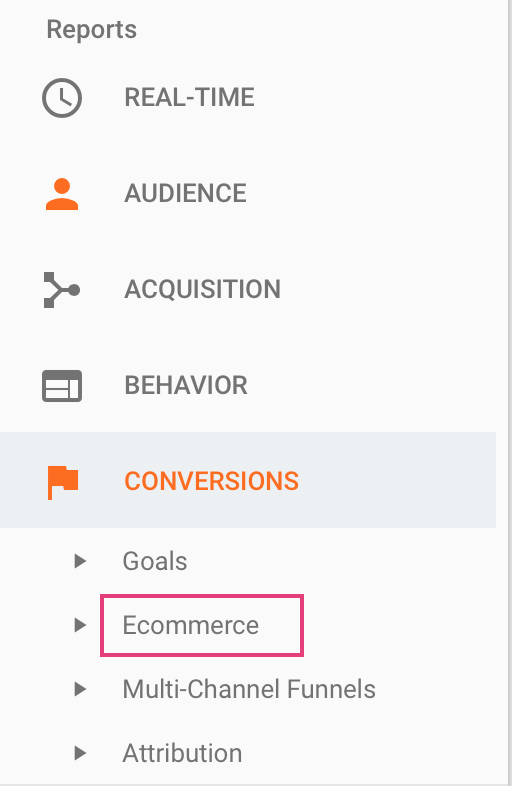 First, go to the Admin section of your Google Analytics account. Then, select the account and web property that you’d like to track. Turn the Enable Ecommerce status to ON and that’s it! 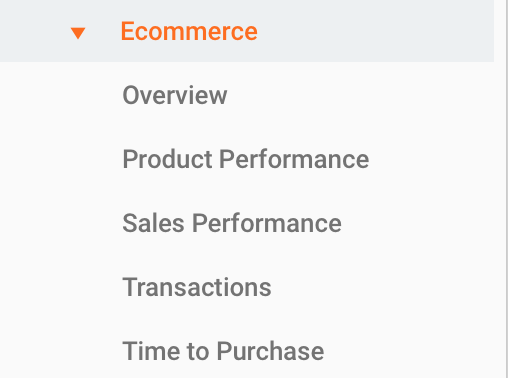 Once you have it set up, you can go to the “Ecommerce” tab to find the appropriate metrics. It’s not enough to simply track how well your content is doing in terms of audience engagement and growth. And it’s not enough to track your direct response conversions through Google Analytics. Neither of these alone will tell you how your content marketing is fuelling your sales funnel. Solé also used apps to track their day-to-day operations to get an internal gauge of how their content marketing impacted sales. There are apps for keeping tabs on aspects like content marketing, the sales cycle, inventory tracking, project management, and more. Niche content marketing is a concept that has been floating around the digital sphere for a very long time. Yet, it is still relatively untapped particularly for e-commerce businesses. Finding your unique subset of the market is an instant way to differentiate yourself from your competitors and have a solid platform on which to build your content strategy. Your customers will be more engaged, you story will resonate better, and your marketing funnels will be more effective. No doubt, the entire sales and marketing cycle when using content as your main driver is a longer process. But in the end, you’ll have a business with staying power. The key is to ensure that you remain flexible. Markets become more competitive. Marketing strategies become less effective. Distribution channels become less profitable. The point is, there may be a time where your brand has to go through a necessary evolution. Solé experienced this first hand when competitors began tapping into their space with a cheaper and lower quality product. It was then that they really doubled down on the lifestyle-specific niche content marketing. Would you have the same ease of transition? Possibly, but it can’t happen if you’ve solidified yourself into a box. Will you have the same degree of success that they did? That, nobody can guarantee. But what I can say with certainty, is that if you execute the strategies, your time and effort will be rewarded twice over. Was this case study helpful? Are there anything to add? What are your thoughts?